HOOK OF HOLLAND, Netherlands (AP) -- Traffic moves quickly and smoothly at the Hook of Holland ferry terminal on the western edge of Europe's biggest port, with hundreds of trucks streaming onto ships regularly setting off for the English port of Harwich. Just one truck driver showing up at the docks without the proper paperwork and being forced to turn around in the cramped dockside "could throw it all into chaos," says Gert Mulder of the Dutch Fresh Produce Center. His organization represents some 350 traders and growers' associations who export hundreds of millions of euros (dollars) worth of produce to Britain every year. "Fruit and vegetables are quite easy at the moment," Mulder says. "But if there's one truck that's not well documented, everything blocks." British and Dutch authorities have warned there could be huge traffic jams approaching ports on both sides of the North Sea as truck drivers and customs officials adapt to Britain's life outside the EU's single market and customs union after March 29. Roel van 't Veld, Brexit coordinator with the Netherlands Customs Authority, says that the number of completed forms drivers need to leave the EU and enter Britain could rise from one or two now to nine. Mark Dijk of the Port of Rotterdam says that many drivers who arrive without the correct papers should be able to straighten out the problem within minutes. But he added: "Two-to-five minutes ... where 400-800 trucks are being loaded within an hour can be a lot of time." Dijk says the port is looking for extra space to park trucks as the Brexit date looms. Dutch ports handle shipments to Britain from the rest of the EU and further afield, and a report by the Netherlands Institute for Transport Policy Analysis estimates that cargo leaving the Port of Rotterdam could drop by 4.5 percent if there is no Brexit deal. The government has set up an online Brexit counter and checklist for companies doing business with Britain, but a report this year warned that only 18 percent of Dutch companies were prepared. Some 35,000 Dutch companies that do business with Britain have no experience of dealing with countries outside the EU single market. "Exports will go down and that will translate into lower prices and lower production of Dutch agriculture," said Siemen van Berkum, an economist at Wageningen University who wrote a Dutch government-commissioned report on the possible economic fallout. "We estimate about 2 percent of the production value will be foregone and that means about 500 million euros on a yearly basis." If there is a hard Brexit, Van Berkum says, "everybody loses." It is a model of efficiency. 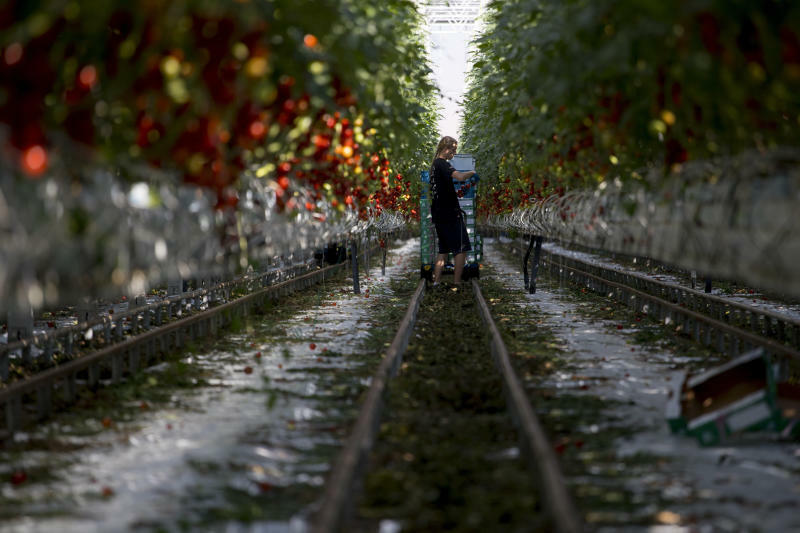 Staff use bicycles to get around a greenhouse the size of about 10 soccer fields, while automated carts tow trollies stacked high with boxes between carefully manicured rows of vines heavy with tomatoes ranging in color from bright red to light green. From the greenhouse, the tomatoes are sent to traders who take orders and organize exports. From the Lans greenhouse in Maasdijk, it's only a 10-minute drive to Hook of Holland. The tomatoes wind up in stores and restaurants including British supermarkets. Wilko Wesse, a staffer at Lans, says the company's larger tomatoes are ideal for one of Britain's signature meals - the full English breakfast with its bacon, sausages, fried eggs, mushrooms and roasted or fried tomatoes. "If there are a lot more checks, the time between harvest and laying in the supermarket will be longer and that is not good for your fresh product," says Wesse.